This property is directly associated with the initial period (1902-1920) of downtown commercial expansion that occurred due to local economic prosperity after the Klondike Gold Rush and in tandem with explosive population growth and suburban residential development. During this era, modern urban architectural scale began with the construction of the earliest steel-frame highrise buildings and the establishment of a concentration of banking enterprises and department stores along Second Avenue from Cherry Street to Pike Street. The initial regrading of Denny Hill and the commercial redevelopment of the former University Grounds (University/Metropolitan Tract) were major factors that facilitated northward and eastward commercial expansion. In 1914, the owners of the Frederick and Nelson Department Store purchased property with the intention of building a large, five-story store at Fifth Avenue and Pine Street, thus solidifying the location of the future downtown retail core. A significant number of extant commercial properties dating from this era remain within the downtown commercial core, including: numerous hotels, banks, business blocks and early highrise commercial buildings, as well as clubhouses, apartment houses and theaters. However, few specialty and department store buildings from this era remain intact and well preserved. As the retail district expanded along First Avenue and uphill along Second Avenue, a fairly wide range of store buildings were designed and constructed according to specific use, lot size and location. By 1910, a distinct concentration of specialty and department stores were located along Second Avenue from Marion Street to Pike Street. The Rialto Building (1894, destroyed) at Second Avenue and Madison, housed the Frederick and Nelson Department Store, which was one of several major retail enterprises that made Second Avenue a fashionable shopping district, including the Bon Marche Store (1896, 1902, 1911, destroyed) at the SW corner of Second Avenue and Pike Street. The street included at least five other major buildings, including: the Arcade Building/Rhodes Store (1903, destroyed), the Galland Building/Stone Fisher Lane Store (1906); the Chapin Building/ McDougall and Southwick Co. (1907, destroyed); and subject J.A Baillargeon Store (1908); all housing specialty and department stores with expansive street frontage and located at prominent street intersections. Buildings specifically designed to be devoted to specialty retail or department store use typically included lower floor level commercial display spaces and upper floor level loft, sales and/or storage areas. This building type did not require as much natural light and ventilation as neighboring business blocks and hotels; thus, lot coverage and building mass could be maximized. Specialty retail and department stores typically required more elaborate interior finishes and fittings, as well as more elaborate exterior construction with large display windows in order to exhibit merchandise and often included canopies or awnings providing pedestrian protection. The original lower two-story portion of the Hancock Building was constructed prior to 1903, and very possibly in the 1890s. In August 1910, the construction of three additional top stories was under way. The building was designed to be inner connected via “viaducts” at the third, fourth and fifth floor level to the Bon Marche Department store complex across the alley to the east. Architectural drawings for the store building addition were prepared by Graham and Myers in May 1910 for Herman Chapin, Esq. Mr. Chapin also owned the nearby Chapin Building that housed the McDougall and Southwick Co. Store (1907, destroyed). 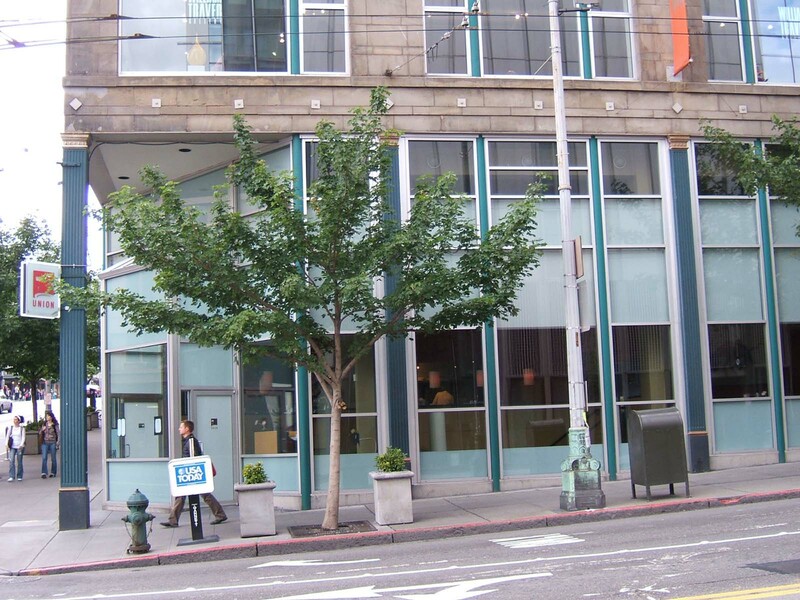 By 1911, the Bon Marche operated in three interconnected buildings on the adjacent half block facing Second Avenue, including an expanded five-story building (at the SW corner of Second Avenue and Pike Street) the original portions of which was constructed in 1896 and 1902; a six-story component located mid-block (c.1900); and a seven-story, three-part commercial block designed c.1910 by John Graham, Sr. located at the NW corner of Second Union. The skybridge as designed appears to have interconnected the Hancock Building to the mid-block building, although the new seven-story block was either also under construction or completed about the same time. The Bon Marche remained at this location until it relocated in 1929. It is assumed that the Hancock Building continued to be used by the Bon Marche during this period. The modern five-story Bon Marche Department Store was also designed by John Graham and encompassed a full block at Pine Street between Third and Fourth Avenues. The building appears to have been owned by the Hancock Building Company, Inc. until it was purchased in 1937 by Harold Poll. By 1937, tax records describe it as store and loft building that included eight stores. In 1985, Harbor Properties renovated the building in conjunction with other redevelopment projects in the immediate neighborhood. The architectural partnership of David J. Myers and John Graham, Sr. (c.1905-1910) produced apartment buildings, private residences and several buildings constructed for the Alaska-Yukon-Pacific Exposition in 1909. Myers worked with Virgil Bogue in 1911 on the ill-fated Municipal Plans Commission and produced many of the drawings for the proposed architectural and urban design projects. He later served on the architecture faculty at the University of Washington prior to entering into the prolific partnership of Schack, Young and Myers in 1920. The architect, John Graham, Sr. (1873-1955), was one of the city's most prominent designers. Born in Liverpool, he apprenticed as an architect in England before moving to Seattle in 1901. He was responsible for many of the city’s most important landmarks. His work covered a wide range of building types, including a number of residences; the Ford Motor Company assembly plant (1913); office buildings including the Securities building (1912-14), Dexter-Horton Building (1921-24) and the Exchange Building (1929-31); institutions (four buildings at the University of Washington, 1927-28) and the U.S. Marine Hospital (1931-34); and department stores (Frederick & Nelson (1916-19) and the Bon Marche (1911 and 1928-29), as well as churches, yacht clubs and apartment buildings. He also embraced a variety of styles, from the Tudor Revival to the Art Deco masterpieces of the Exchange Building and the Marine Hospital. This is a partially intact example of a particularly rare and important downtown property type from this era and is associated with the history of the original Second Avenue Bon Marche department store. It is also associated with the notable architecture partnership of Graham and Myers as well as the career of the highly regarded department store architect, John Graham, Sr. This property may potentially meet local landmark criteria. Located at the NE corner of First Avenue and Union Street, this five-story building originally housed several retail stores and upper floor level loft spaces. The ground floor currently houses retail stores and a restaurant and the upper floors are used for commercial office purposes. It measures 111’ x 120’ with five window bays oriented toward First Avenue and six window bays toward Union Street. It exhibits a two-part vertical block façade composition and has been completely renovated. The brick masonry structural system (with a masonry basement/foundation) is clad with sandstone at the two-story base and with buff color brick accented with cast stone trim at the shaft. The storefront level of the base has been entirely reconstructed and does not exhibit any historic exterior building fabric or features. Originally concealed portions of the cast iron storefront structure are now visible. Extant sandstone cladding and original window openings remain in place at the second floor level although all of the original windows have been replaced with a modern product dissimilar to the original windows. The shaft is only accentuated by simple large unframed rectangular window openings in-filled with windows in sets of four (and/or three) with cast stone sills. The current 1/1 double hung sash match the original windows in form/configuration and appear to be original or an in-kind replacement product. A steel fire escape was originally located at the Union Street elevation as indicated by a variation in the window configuration/cladding at one of the central window bays. The shaft is capped by a partially intact (or reconstructed) sheet metal cornice with a simply ornamented entablature and a prominent dentil course. Alterations have been made to all of the storefront bays and the second floor level windows. All of the storefronts have been reconstructed with modern display windows and a modern glass and steel entry canopy has been installed at Union Street. There do not appear to be any intact or architecturally significant interior building features, finishes or public spaces. "Adding Five Floors to Hancock Building, at First and Union" Seattle P.I., August 14, 1910.